EV owners and advocates are great at talking to people about EVs, and possess a wealth of knowledge on the subject. We want to show our appreciation for our existing electric drivers for all of their help in promoting Northern Colorado as an EV-friendly community. That said, we are launching an EV Owner Challenge as part of this special group buy pricing! You can earn up to $950 in cash and rewards for every EV purchased through your referrals this year. Join the Challenge: You must register for this challenge in order to be eligible for these incentives. To fill out the quick registration form, click here. 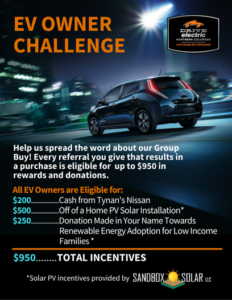 $200 Cash Reward: To claim your cash reward of $200 per EV purchased through your referrals, you must email Tynan’s Nissan and give the name of the person you referred before the Group Buy purchase takes place. Contact Tom Lotz from Tynan’s Nissan at (917)214-9193 or tom.lotz@tynans.com. Solar Discount and Donation: DENC will connect you with SandBox Solar LLC after you register, to claim these discounts and donations. You will receive $500 off of a home PV solar installation when you register for the EV Owner Challenge and an additional $250 donation to support renewable energy adoption for low income families.